Today’s recipe comes from a fantastic Cabo restaurant – Manuel’s Creative Cuisine. Manuel’s is located in The Shoppes at Palmilla, a beautiful Hacienda paradise. 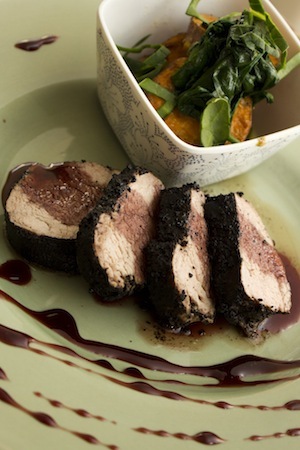 Chef Manuel was kind enough to share with us his recipe for Coffee and Cacao Crusted Pork Filets. I prepared this dish for a small group of friends, and everyone was blown away by the flavors. The dish is complete with a Red Wine and Vanilla Sauce, and Creamy Sweet Potatoes Topped with Sauteed Spinach. Chef Manuel presented the recipe in an easily approachable manor, which led to a great result. What else is to be expected from a chef that has several years experience cooking for the Olympics, the Superbowl, and even President Bush? Manuel’s Creative Cuisine is also celebrating two years rated at #1 by Trip Advisor Customers. The meal was one of a kind; it has brilliant contrasting flavors that create a harmony rarely found. 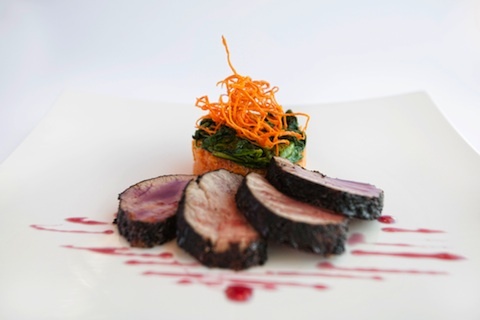 The simple ingredients with amazing preparation are what make this dish so unique; the stimulant of coffee with the depressant of red wine, the pairing of chocolate and vanilla, and textural pairing of spinach and sweet potatoes. This is one of the best meals I’ve ever eaten and it’s all thanks to Manuel’s Creative Cuisine. So if you feel like letting your palette adventure into uncharted territories, I recommend making this dish! Season Pork Filets with Salt, Pepper, and Brown Sugar. What’s your favorite dish at Manuel’s Creative Cuisine? Nick Kern has been creating recipes and writing about food for over 2 years. He is the Owner/Lead Editor of Eating in Bed, where he publishes and hosts original recipes, restaurant reviews, and more. Eating in Bed is known for innovative recipes, like Breaded Pesto Chicken Stuffed with Mozzarella, and our Baking With Blake video series. Nick has teamed up with All About Cabo and Los Cabos restaurants to bring you incredible recipes that showcase the local cuisine.